Join WIT for the Holidays in Philly! We're kicking the holidays off in Philly with a networking coffee and great conversation, open to WIT members and non-members. 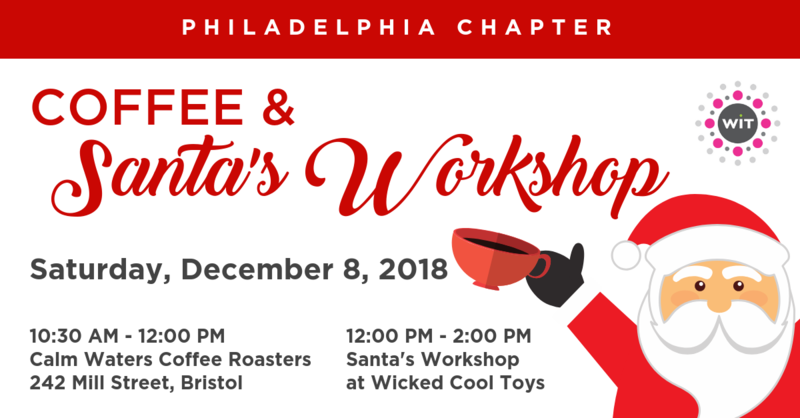 Afterward, families are invited to head over to Wicked Cool Toys for a fun afternoon at Santa's Workshop, a charity event hosted by WCT. Feel free to invite your colleagues! The networking coffee is pay-your-own way. Santa's Workshop is a family event, so bring your kids! COST: Networking Coffee is pay-your-own-way. Please RSVP so we know how many to expect. Santa's Workshop is $20 per child/free for adults. Payment will be accepted at the event.